Today, many large biopharma companies are devoting increasing development efforts to biopharmaceuticals compared with small molecule drugs. In fact, multiple research sources indicate that most are spending 40 percent to 50 percent of their R&D on biopharmaceuticals. To facilitate this trend, incremental innovation in improved manufacturing productivity continues unabated and is a driver for many biopharmaceutical trends. Innovation also speeds discovery, increases options, and can drive down costs and improve productivity. The current situation in biopharma is exciting, with new technologies, biosimilars, cellular and gene therapies, and opportunities in emerging markets. And these innovative platforms are going to continue to need improved manufacturing technologies in the future. In our Top 15 Trends in Biopharmaceutical Manufacturing, 2017, we summarize current major trends affecting biopharmaceutical manufacturing, including highlights from the many dozens of key trending areas we have studied. For example, from our Annual Report, we found that the trend indicated by the largest portion of respondents was manufacturing productivity/efficiency (16.4 percent). This “Single most important biomanufacturing trend” remains at the top of the list after a number of years. Taking second place, for the second year in a row, continuous downstream bioprocessing shows that the biopharma industry is attracted by the novelty and presumed increased productivity and lower costs promised by continuous processing. While these technologies continue to develop, they have yet to achieve commercial-scale applications in most cases. The third most-cited area was manufacturing cost reductions (11.6 percent). As noted, by reducing costs, the industry can contribute to lower healthcare expenditures, which can make costly biologics more accessible to less developed economies, which can also open global market opportunities, including biosimilars. 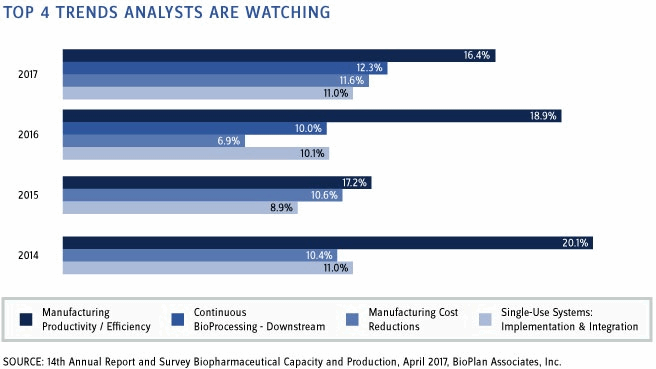 BioPlan annual survey data and other studies confirm that bioprocessing efficiency and productivity, in terms of upstream titers and downstream yields, will continue to rather steadily increase. A byproduct of this is that both drug innovators and bioprocessing supply companies are spending more time and effort scouting and assessing available technologies, process development areas, and manufacturing options. CMOs, in particular, are expected to make sure they are attaining the low costs and product quality attributes their clients demand. The trend of biosimilar product development worldwide appears to be accelerating now that the U.S. biosimilars market is online. The FDA has approved multiple biosimilars, including monoclonal antibodies, and this established precedent and demonstrated feasibility of developing biosimilars to FDA standards means we can expect more of these cost-driven biologics on the market. The global biopharma processing and manufacturing environment is expected to continue improving bioprocessing, hiring skilled staff, and incorporating technological advancement to improve and increase production of biologics, small molecule drugs, biosimilars, and other formulations. We also assess how current bioprocessing trends are affecting technology requirements and buying patterns for bioprocessing end users. By assessing current and future needs of bioprocessing end users and evaluating what suppliers are focusing on to meet those needs, we can better predict what suppliers should be investing in to meet current and future demand. 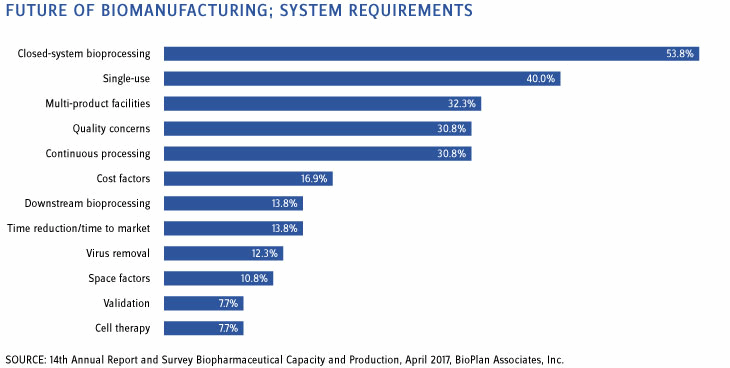 When asked about which systems are going to be required in the future, over half of the industry responded that bioprocessing will need to be done using more closed-system technologies (noted by 53.8 percent). Figure 2 below also shows that 40 percent agree that suppliers are expected to continue developing technologies, applications, and improvements for single-use systems. Based on our analyses in China and other emerging markets, we are already seeing single-use platforms dominating clinical-scale facilities. Most new entrants, especially those seeking to rapidly attain cGMP manufacturing for Western markets, will continue these manufacturing strategies. In addition, nearly a third of respondents (30.8 percent) believe that continuous bioprocessing (CBP) is a key area that suppliers and innovators are expected to develop. And although only around 12 percent feel CBP is the single most important trend (see above), the pressure on suppliers and inventors remains. We note that CBP tends to involve complex operations and significant logistical challenges at large scale and is not yet ready for broad, commercial-scale adoption. The industry continues to explore and develop new bioprocess technologies. What is available is acceptable, but not optimal, as shown by the data above. As the industry matures, dissatisfaction with many current bioprocessing technologies and equipment is growing. Coupled with an apparent sense that the rapid rate of innovation in bioprocessing in the recent past may be slowing, this puts more pressure on industry suppliers to build better, more effective platforms. To meet industry’s appetite for innovation, some larger suppliers have created innovation centers and established more collaborative, customer-centric approaches to new product development. Smaller suppliers continue to innovate and seek development partners, so the state of innovation in this industry remains well-grounded. Technological advances in bioprocessing have been implemented in recent years, but downstream technology and capacities continue to lag behind upstream bioprocessing. These purification areas are moving toward effective performance, productivity, and cost solutions. When these are introduced, the pendulum may then swing toward needs for better upstream technologies, more effective expression systems, improved alternatives to current bioreactors, and, of course, even lower costs. 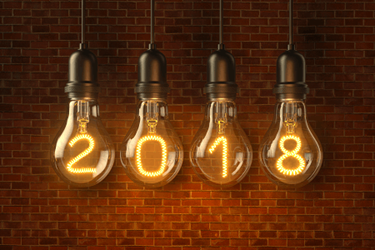 The biopharma industry has always sought improved productivity, cost savings, and quality, and according to our survey data, 2018 will be no different. Global competition is always a trend, and 2018 will follow that pattern. Biosimilars (and biogenerics in lesser- and nonregulated international markets) are resulting in a number of new players entering the biopharmaceutical industry. The largest number of biosimilars in development remains in the U.S., with the U.S. still the primary location for biopharmaceuticals R&D. As the largest market for biopharmaceuticals, that soon will include biosimilars. Asian countries such as China and India are improving their production capabilities and entering the biosimilar market in force, according to our China facilities analysis2. Capacity growth, combined with new and expanded facilities coming online, is increasing most rapidly in China, India, Korea, Singapore and, to a much lesser extent, other Asian countries, but with those countries’ capacities increasing from low or near-zero baselines. Biopharma and its supply industry have been growing consistently at approximately 14 percent based on sales of biologics over the past 20 years; currently, sales of biotherapeutics are well over $200 billion. With a very healthy pipeline of innovative products and growth in international sales, industry revenue can be expected to further steadily increase. Based on our survey, we found that the most important trend in 2017 — and the one we should watch in 2018 — is the efficiency and productivity of manufacturing in order to meet increasing demand, lower costs, and improve overall quality. Our survey data also indicates that improving continuous bioprocessing and reducing costs of production, especially as related to single-use technologies, are front and center in the minds of biopharma executives. Additionally, the increasing expansion in the number of facilities and the prevalence of biosimilars in the market mean that in 2018, companies should keep their eyes on new tech and ensuring skilled staff are retained and available for potential expansions. Eric S. Langer is president and managing partner at BioPlan Associates, Inc., a biotechnology and life sciences marketing research and publishing firm established in Rockville, MDm in 1989. He is editor of numerous studies, including Biopharmaceutical Technology in China, Advances in Large-scale Biopharmaceutical Manufacturing, and many other industry reports. You can reach him at elanger@bioplanassociates.com or visit www.bioplanassociates.com. Survey Methodology: The 2017 14th Annual Report and Survey of Biopharmaceutical Manufacturing Capacity and Production yields a composite view and trend analysis from 227 responsible individuals at biopharmaceutical manufacturers and contract manufacturing organizations (CMOs) in 25 countries. The methodology also included over 131 direct suppliers of materials, services and equipment to this industry. This year's study covers such issues as: new product needs, facility budget changes, current capacity, future capacity constraints, expansions, use of disposables, trends and budgets in disposables, trends in downstream purification, quality management and control, hiring issues, and employment. The quantitative trend analysis provides details and comparisons of production by biotherapeutic developers and CMOs. It also evaluates trends over time, and assesses differences in the world's major markets in the U.S. and Europe.